I was super excited when I learned Twilight Time was going to be releasing this on a Special Edition High Definition Blu-ray. I have often always thought this was a very underrated film. I often find myself watching it over and over again with it pops up on TV. Now this is directed by one of the finest directors of all time. A director often over looked and a director that has never been given the stardom he deserves. He directed one of my Top 20 films of all time, the amazing, controversially 1976’s The Devil’s Playground, a masterpiece of film both in shocking content and brilliant story execution (You can read my review for it HERE ). An extraordinary and thought provoking director the one and only Fred Schepisi. Schepisi has mastered such films as 84's Iceman, 88's A Cry in the Dark, and this one I am reviewing The Russia House. He is a visionary of capturing stories of reality and giving and building emotions. I feel The Devils Playground is his shinning achievement which he also wrote. All his films stand out in one way or another. The Russia House is a unique, personal and filled with emotional intrigue that also grabs the viewer and allows them to be a part of the characters. That is what makes Schepisi’s directing and visionary work so appealing. The Russia House has a wonderful cast of actors. The utterly brilliant, god rest his soul Roy Scheider. Always a treat to see and experience in film. Also starring the very beautiful and stunning and very talented Michelle Pfeiffer. The main man himself the star of the film Sean Connery, James Bond himself. Also starring the great John Mahoney, you can never not mention his brilliant performances in film. Also starring the absolutely brilliant, passed away to soon, the one and only J.T. Walsh. 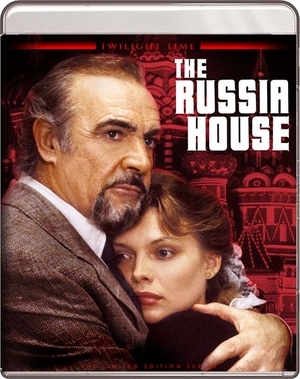 The Russia House is a nice mixture of drama, romance and most of all a thriller aspect. To make a long story short, the plot is about some notebooks that during a book conference is handed over to a British Publisher. Now these notebooks contain Russian military secrets of the highest form. The British Secret Service want to know if these notebooks are real so they bring in the British Publisher Barley Blair who is played by Sean Connery. What Barley doesn’t know is he has just entered into a serious cat and mouse game that now he must solve. Katya is the one who turned over the notebooks. Katya is played by the lovely Michelle Pfeiffer. As you would guess Barley and Katya kind of hit it off. This is based on the novel by John le Carre. He is a wonderful writer I have read several of his books including The Russia House. One of my personal favorites in Tinker Tailor Soldier Spy which has also become a TV series and movie. Other works which has also become movies, The Tailor of Panama, The Constant Gardener, A Most Wanted Man, The Spy Who Came in from the Cold. He is a natural talent of storytelling that weaves a thick blend of thrilling reality around drama that the reader can relate to. The Russia House is another fantastic watch. Twilight Time has given this older film a new beautiful high definition outlet for a modern generation to experience. Twilight Time always amazes me with the beauty they put into their products. Another fantastic, amazing job in bringing this film to a high definition Blu-ray. Truly a positive example of how to treat film and transfer it to a crisp, clear imagery. Wonderful sound quality that I see no fault with. Both audio and video is spot on. Isolated Score Track. You get the great Isolated Music Track. The man behind the music for this film needs no introduction to cinema fans. The one and only Jerry Goldsmith. Goldsmith has been a part of some of the greatest film scores both small and large. Just to mention a few, The Omen, Alien, Poltergeist, The Secret of NIMH, Gremlins, Hoosiers, Total Recall, Basic Instinct, Rudy, L.A. Confidential, The Mummy, Von Ryan’s Express, The Blue Max, Planet of the Apes, Patton, Tora! Tora! Tora!, Papillon, Chinatown, Logan’s Run, Legend, Alien Nation, The Burbs, many of the Star Trek films. He did so many memorable scores that stand out and are landmarks in film. When Goldsmith died in 2004 the cinema world lost a true master in film making. The music world lost a music genius. Twilight Time honored a passionate master with this special feature. Building The Russia House is a little over 8 minute archival behind the scenes program. You also get the all-important and wonderful Booklet written by the amazing film historian Julie Kirgo. Always a treat to experience. Again another fantastic experience in seeing an older film on a new transfer. A beautiful special edition 3,000 Unit production. Twilight Time has honored this wonderful film. A great product, equally a great film. Highly Recommended.